Tatkal tickets have been in place for a long time for all railway users in India. However, the railway body decided to introduce the premium tatkal, which was geared towards offering different services to the passengers. People have been highlighting that the main idea behind the introduction of premium tatkal is increasing prices, which was not a welcome decision. It was clear that people did not get the contrast between tatkal tickets and premium tatkal tickets. 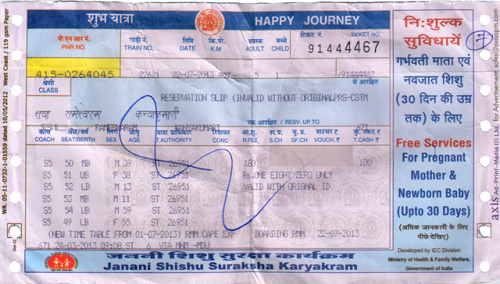 The tatkal ticket is a train ticket that is used in many countries around the world. One of the main characteristics of the tatkal ticket is that it allows all the passengers to book travels within a span of two days. It is worth noting that tatkal tickets are geared towards offering people the chance to travel immediately. Railway board members highlight that tatkal booking for every train is available for booking two days in advance at 8 am. Premium tatkal is a ticket being introduced by the railway board, which will have its own characteristics that are different from the commonly used tatkal tickets. One of the main properties of premium tatkal tickets is the dynamic pricing which means that passengers will be charged higher prices in case of increased demand and lower prices in case of lower demand. One of the main differences between tatkal tickets and premium tickets is the pricing strategies. The price of a tatkal is fixed and well known to all the passengers and railway users while the price of the premium tatkal is dynamic. The price of premium tatkal is dependent on the demand or the availability of the passengers willing to travel. The more the number of people traveling, the higher the cost of premium tatkal while the lower the number of traveling passengers the lower the prices of premium tatkal. However, it is worth noting that the price of premium tatkal does not fall below the price of tatkal in low demand seasons. The process through which the tickets are booked varies between tatkal and premium tatkal. It is highly known that tatkal tickets are available on railway outlets and over the counter agents allowed by the board to sell tickets. For example, tatkal tickets are available and accessible through MakeMyTrip and Yatra.com among other ticket platforms. This is not the same for premium tatkal tickets as they are only available on an online platform that is managed by the railway-marketing department. The internal organ of the travel agency, which explains why the ticket-selling agents are not allowed to sell these types of tickets, manages to sell of premium tatkal. The concession is the process through which an organization gives a preferential allowance or rate to a certain group of people owing to their distinct characteristics. For example, all people considered by the rules and regulations as underage are given preferential allowances in various circumstances. One of the main difference between tatkal and premium tatkal is that tatkal tickets offer preferential allowances to young children, senior citizens, and people with disabilities. The concession is geared towards ensuring that special interest groups do not pay equivalent ticket prices charged to other people. However, premium tatkal does not offer preferential allowance or reduced ticket prices to children, senior citizens, or other special interest groups. Waitlisting is the process of withholding vital information concerning a certain person before making an informed decision concerning the travel date for passengers. It is in public knowledge that tatkal tickets encourage waitlisting which means that a passenger may book a ticket for travel tomorrow only to for him or her to wait for more than three days before finally traveling to his or her destination. On the other hand, any passenger who books a premium tatkal is not listed on the waitlist and such people usually travel by train they booked. Premium tatkal holders are given the preference of traveling immediately because they pay significantly higher prices as compared to tatkal ticket holders. Many people may confuse cancellation of tickets with waitlisting. It is worth noting that a passenger on the waitlist will ultimately travel while a person with a canceled ticket will not be allowed to travel. Tickets under the premium taktal are never canceled and in situations where they are canceled, the money is never refunded because it is assumed that the passenger failed to turn up to the railway station for reservation of his or her seat. On the other hand, tatkal tickets involve cancellation and waitlisting. However, in case a tatkal ticket is canceled, the passenger is given an opportunity to get his or her money back unlike the premium tatkal where one cannot get his or her money back. Differentiating tatkal tickets and the premium tatkal ticket is an important aspect because it will help an individual to make an informed decision on what to buy with respect to their needs. It is also worth noting that anyone traveling with young children and senior citizens or special interest groups should book tatkal tickets because they offer preferential allowances to these groups, which helps people in cutting the traveling expenses. Jecinta Morgan. "Differences Between Tatkal and Premium Tatkal." DifferenceBetween.net. January 22, 2018 < http://www.differencebetween.net/business/marketing-business/differences-between-tatkal-and-premium-tatkal/ >. Chhatbar, Mehul, And Dr. Rashmi Maurya. "A Cram Of Consumer’s Buying Performance For Long Journey Train Tickets." Clear International Journal of Research in Commerce & Management 4.4 (2013). Magesh, Vivek Sundar. "Maximising Revenues in the “Tatkal” Category of Indian Railways." Mukhopadhyay, Sajal, et al. "An efficient auction based TATKAL scheme for Indian Railway." Innovative Computing & Communication, 2010 Intl Conf on and Information Technology & Ocean Engineering, 2010 Asia-Pacific Conf on (CICC-ITOE). IEEE, 2010.